When I think of root vegetables, the legendary Gene Thiel and his selection of soil-spattered heirloom beets, carrots and potatoes at the Portland Farmers Market always comes to mind. I remember when I first gazed at his table, the gnarled and twisted vegetables, so earthy and otherworldly, vibrant scarlet and harvest moon hues. Each week, the blue-eyed farmer would cradle a beet in his weathered hand and share a family recipe or tip for coaxing the best flavors from his edible roots. In those moments, I fell for the Persephone vegetables, the underground (and often under-appreciated) out-of-sight gems. With their earthy flavor and unassuming beauty, I found the vegetables more mysterious than, say, spinach or squash. My only hesitation with root vegetables — and moving beyond beets to burdock root or rutabaga — was identifying the unfamiliar and figuring out where to start in the kitchen. 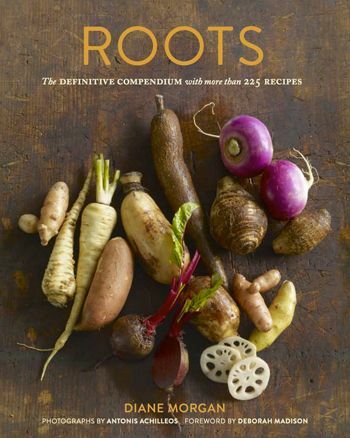 Thankfully, Portland-based author Diane Morgan just released “Roots: The Definitive Compendium with More than 225 Recipes” (Chronicle Books; $40; 432 pages). In this ultimate go-to guide for edible root vegetables, she champions the familiar (beets, carrots, potatoes), the unfamiliar (jicama, salsify, yuca), and the practically unheard of (cassava, galangal and crosnes). In her extensive research, Morgan digs deep as a root sleuth, unearthing curious lore and odd stories about how roots were used medicinally, as aphrodisiacs, and to treat scurvy in days gone by. She dishes tidbits to share at the table — for instance, did you know that the first carrots were purple, not orange, were native to Afghanistan and can be traced back 3,000 years? Or that the thistle-topped head of burdock plants inspired Swiss inventor George de Mestral to create Velcro? The cookbook is organized into 28 chapters, alphabetical by vegetable, beginning with Andean tubers and closing with yuca. Each chapter unfolds with the history and lore of the vegetable, followed by notes on varieties, nutrition, availability, storage and basic use and preparation. The easy-to-find and comprehensive narrative on each root turns the cookbook into a handy reference guide for any home cook or avid gardener. I loved discovering that Thomas Jefferson planted salsify at Monticello and that the cultivation of the humble turnip dates back at least 4,000 years. Bright, beautiful photographs by Antonis Achilleos are sprinkled throughout the text, spotlighting dishes like Carrot Ribbons with Sorrel Pesto and Crumbled Goat Cheese and Seared Scallops with Wasabi-Daikon Relish. Rustic root portraits provide an ideal introduction to the mysterious malanga and magnify the simple beauty of the everyday sweet potato. The creative recipes — Microbrew Braised Rutabagas and White Carrot Crab Bisque — in the encyclopedic collection engage the reader with personal anecdotes and a conversational tone both inviting and inspiring. An entire autumn-to-winter dinner party from salads and soups to side dishes, main courses, drinks and desserts can be planned using recipes from Roots. As the days grow shorter and hibernating season nears, “Roots” is a cookbook to keep close to the hearth and an inspiration to gather friends around the table. Kerry Newberry is vineyard-hopping, Pinot-sipping food and wine writer in Portland. 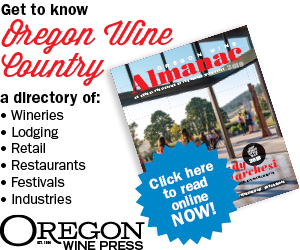 Enjoy these fantastic root-sy recipes from the cellars of Oregon’s wineries. 1. Heat olive oil in a saucepan over medium heat. Add shallots and sauté until lightly caramelized. Add the beet, thyme, rosemary, salt and mushrooms and sauté for a couple minutes. Add stock and wine. Simmer over low heat for 20 minutes or until reduced by one-half. 2. Strain the mixture into another saucepan and add dried cherries. Simmer for another 15 minutes. Add vinegar and salt and pepper to taste. The sauce should be thick enough to coat the back of a spoon. Note: This recipe works well with potato gnocchi or red meat. 1. Place a large sauté pan over medium heat; add olive oil and butter. Add sweet potato and red onion and sauté for 10 minutes, stirring occasionally. Sweet potatoes will still be firm. Transfer sweet potato and onion mixture to a bowl to cool. Add prosciutto and mix well. 2. While sweet potato mixture is cooking, combine eggs, half & half, white wine and Dijon mustard in a bowl and mix well. Stir in thyme, salt and pepper. Add bread, and let sit for 25 minutes, stirring occasionally. 3. Heat remaining olive oil in sauté pan over medium heat. Add kale and water. Stir until kale is wilted slightly but still bright green in color, about 5 minutes. Add the kale to sweet potato, onion and prosciutto. Stir to blend all ingredients together. 4. Preheat oven to 350°F. Coat a 13-by-9-inch baking dish with remaining butter. Add ½ egg and bread mixture to baking dish. Top with ½ sweet potato kale mixture. Sprinkle half each of cheddar and Parmesan. Repeat layers again and sprinkle with remaining cheese. 5. Cover with foil and heat for 30 minutes. Remove foil and heat for another 20 minutes, until pudding is set and top starts to brown. Let sit for 10 minutes and serve. Makes 8 (main) or 12 (side dish) servings.